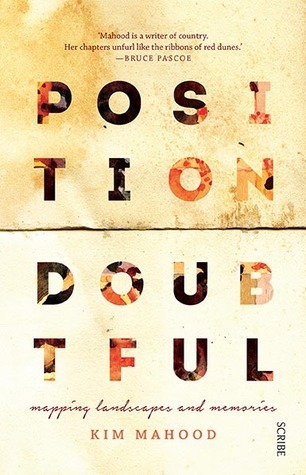 I had bought a copy of Kim Mahood’s new memoir Position Doubtful before I went to the Bendigo Writers Festival where she was in conversation with Susan Martin. 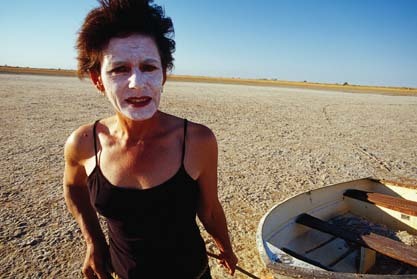 Although I felt that Craft for a Dry Lake (2000) was a bit too long for itself and I lost interest in Mahood’s identity issues with her father, nevertheless it was a book in which she wrote memorably about the beauty of the outback, and perceptively about Aborigines especially women. (And it won the 2001 NSW Premier’s Award and The Age non-fiction Book of the Year). So I hadn’t hesitated to buy the new one, and listening to Mahood talk about it at the festival ensured that I kept it near the top of the TBR pile so that I could get to it soon. It’s a book that repays slow, careful reading, and I was drifting through it when I was unexpectedly able to take up a place at the Indigenous Language Intensive program organised by Writers Victoria. So it was just serendipity that I was learning about ways in which non-indigenous authors could write respectfully about Indigenous people, their culture and history, when I was reading a memoir by an author who has made it her life’s work to do just that. Mahood’s family were part of the pastoral industry in the Tanami district and she grew up enjoying close relationships with the local indigenous people who were employed there. Although the Tanami Downs Station is now in the hands of its traditional owners, the Warlpiri, she has retained her connections with them and with the descendants of the Walmajarri stockmen who worked for her father on the station. Torn between modernity and a need for quiet privacy, and her love of the desert country and the interconnectedness of life in indigenous communities, she spends part of each year in the Tanami and Great Sandy Desert region, working on projects with the people, who have given her a ‘skin name’ and treat her much like one of their own. To the reader it seems that part of her identity is enmeshed with theirs though she doesn’t presume to claim any entitlement. In fact it seems to be the reverse: she has acquired obligations, some of which are onerous and tiresome, but others which bring her joy. Mahood is an artist, a writer and a maker of maps, but the maps she makes are not like the ones in a school atlas. Like the maps my small students used to make about their weekends (instead of laboriously writing a ‘journal’ each Monday), Mahood maps story. It’s a case of identifying the significant places, and showing that ‘this happened there’. This means that the maps are not topographical and representational in the way that we are used to. Slides of these maps/art works were part of the presentation at the BWF, and IMO this is a book that demands images to amplify Mahood’s descriptions, so it is a real pity that it’s been published with small B&W images that merely frustrate the reader. I know that decisions about colour plates are commercial decisions, and I know that this book will get a wider readership because it costs less. But still, reading it, I hankered for the kind of publication that Wakefield Press would have made of it. It would have been produced on the right kind of paper on bigger pages to show off the images clearly, and it would have included full colour reproductions of the paintings. Wakefield’s motto is that they make ‘beautiful books’ and Position Doubtful deserved to be a beautiful book as well as an interesting one. At the gateway where the road forks, I leave the vehicle and walk. I want to come to the place without insulation, with all my senses alert. In the sand and gravel of the old road, I make out the tracks of dingo and camel, kangaroo, python, goanna and bush turkey. The iron roof is slumped and buckled, draped like a heavy cloth over the pink stone walls. One end of the house is engulfed in crimson bougainvillea, and the white satellite dish has slid from the roof and nestles like an eardrum in the blaze of flowers. Sections of the roof are missing, all the interior windows are gone, the fly wire ripped away from verandahs that surround the building. A dozen Major Mitchell cockatoos have stationed themselves on an overhanging branch to keep an eye on me. Mahood is painfully honest: there is no sentimentalising and she is brutal about some of the dysfunctional life she observes amongst both inhabitants both Black and White. When she drives an incontinent old man across the desert for miles, you can almost smell his acrid clothing, but she treats him with respect and his stories are invaluable. [Autocorrect just turned my typo of ‘his stories’ without the ‘s’ of ‘stories’, into ‘histories’, and of course, that’s what they are.] When she observes with an experienced eye, the arrival of new staff in the White community, she predicts trouble arising from their arrogance and authoritarianism, and she is deeply grieved to be proven right. The book is aptly titled. Position Doubtful is how old maps of desert country noted features that before satellite imagery were not neatly located by lines of latitude and longitude. Places heard about, but not seen, or not recorded accurately, or were ephemeral like the intermittent river systems of Australia’s capricious rainfall. Waterholes that came and went; man-made structures that fell into disrepair when their discouraged entrepreneurs abandoned them. Mahood and her Aboriginal collaborators are mapping these places and their stories, but the doubts remain. There is a hesitancy about the place of any people in this region: change has made everything tentative as we see when Mahood tells us about the fragile health of the keepers of the stories. How some gendered stories have had to shift to female custodianship. How the young people seem mostly not interested. Some parts of the book are rather melancholy. Source: Personal library (I think I bought it via Readings Monthly). I think you’re right that it’s a shame that someone who works visually should not have produced an ‘art’ book rather than just a text. And I’d be interested to see the work of Pamela Lofts, it seems it might be an ironic take on something that Mahood takes very seriously. As for ‘white staff’, I wonder if they’re a condition of ‘white’ funding. As a teacher-librarian, I knew Pamela Loft’s children’s picture books: Wombat Stew, and Hunwick’s Egg and so forth. I was quite startled to see the strange (and I have to say, rather odd) art pieces in Mahood’s book. Perhaps I’ve absorbed some of Mahood’s reservations about them, but they seem as if she was imposing some values on the landscape that didn’t belong there. As I’ve said you can’t really see any of the paintings properly in this book, but if you Google her name, you can see the kind of thing she did. (BTW As Mahood explains in the book, Lofts died young in her 50s, just recently in 2012). Another beautiful and meaningful post that gives so much insight and thoughtful comment into the writer and the book. We need to hear more of these voices! When I walked the Larapinta Trail and camped in the desert I understood and envied our Indigenous guides’ devotion and attachment to country. Mahood’s ‘shimmering traces’ resonates with the stories we absorbed as we sat around the campfire, and the inexplicable feelings I experienced in so many places. I’ll read this later. My bookgroup is choosing its next six books tonight and I’m really going to push this book as I want to read it. Wish me luck! I will indeed, it can be a very fraught process choosing books for a book group! Thanks, though fortunately our group’s selections are never fraught. There’s a lot of good will, there’s no turn-taking, there’s just lively interest. We’ve rarely chosen a book that I don’t think is worth reading. I’m hoping we’ll choose Patric too – there’s a bit of a groundswell for it so I think it will be in.